Getting the job done better and faster is the name of the game in the snow plowing industry. 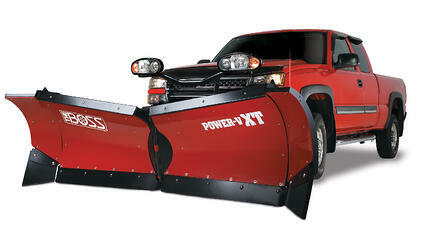 To increase your plowing efficiency the addition of blade wings is a choice of many snow plow contractors. Snow plow wings are perfect for parking lots and apartment building complexes or any area where you need to move large amounts of snow in a short amount of time. The BOSS Snowplow Plow Wings increase the width of a snow plow blade by a full 22 inches. Each wing kit is 11 inches in width and is situated at a 30 degree angle. These features provide a much larger blade for windrowing, while at the same time minimizing snow spill off. When it comes to cleanup work or moving bulk snow from a parking lot, plow wings can help you finish jobs faster and easier. As seen in the video below, plows wings can be easily installed on your plow. Once installed, plow wings attach or detach in seconds making it even easier to add or take away plow width for the job at hand. *THE BOSS Snowplow Plow Wings are available for the Power-V, Power-VXT and Straight Blade models excluding the Sport-Duty and Municipal models.